118, El Aziz Othman St. Although Cairo boasts a wide variety of cuisines, the success of many local restaurants offering Egyptian food proves that Cairenes will always have a special place in their hearts – and stomachs – for local eats. 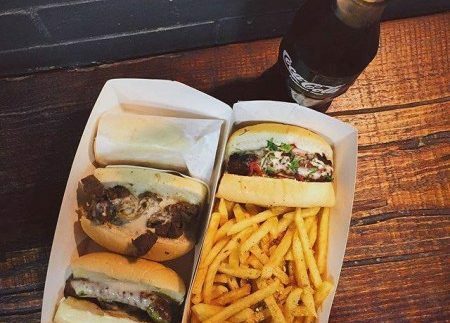 Hidden in the alley next to Cairo Kitchen in Zamalek, Yokal is the latest addition to the list, offering classic street-food staples, kebda and sogo’ sandwiches. Comprising high tables, side bars and offbeat stools made of Coca-Cola bottle crates, the cool setting perfectly matches the simplicity of the menu, which is limited to the two sandwiches mentioned above, in addition to kofta, fries and a single dessert item, Skalans – each for 7LE. Yokal also has a couple of combos that bundle all the items of the menu in two different portions; while the first, Totala (60LE), has a total of 8 sandwiches – two of which are Skalans – with fries and drinks, we opted for the Kabbot (35LE), which includes one of every item on the menu. Less than a minute after placing the order, the food was ready. Separately wrapped in paper and placed next to each other in a narrow pull-out box, the significantly-small sandwiches prove that a combo in Yokal is the wisest choice for the hungry. We started with the kofta sandwich, which was excellent. Besides the freshness of the bread, the kofta itself was perfectly grilled; seared from the outside, but still juicy in the centre, its tenderness was complimented by the light tehina sauce. Scrumptious as the first, the sogo’ sandwich was noticeably light and not as greasy as the usual sogo’ sandwiches found elsewhere. Equally tasty was the kebda sandwich; the hefty amount of the diced liver was perfectly cooked and well seasoned, marking the sandwich the best on the savoury menu. Simply fresh and crispy, the fries didn’t have any distinct taste of their own, but they reflected the simplicity of the menu. After trying all the savoury items, the sweet skalans was the cherry on top; the balanced mix of cream and halawa paste spread inside the honey-soaked crispy bread made for a happy ending to an already-great experience. All in all, Yokal delivers what it promises; offering a small number of well-executed easy eats, against a chilled setting , it puts the theory that ‘Less is More’ into practice. Yokal delivers to Zamalek; call 01144494466. The portions are rather small.